David is an English Language Fellow at the National Technical University in Sevastopol, Ukraine —a small city located on the Black Sea coast of the Crimean Peninsula. For nine years he has been teaching English to international students, helping them to “be critical, creative, and compassionate global citizens.” In addition to teaching English classes at the university and presenting at teacher training conferences, David has become involved with the community by inviting local students, teachers, and community members to come together for conversation clubs where people can practice their English and learn more about American culture and traditions. In his communication classes and conversation clubs, David has found that the traditional American songs available on the American English website have been effective educational tools. 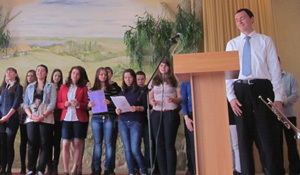 In addition to enriching the lives of the students and teachers he is working with in Sevastopol, David has found the experience to have strengthened his qualifications as an English teacher.